Over 65,000 sq ft of elegant and flexible function space, and is considered the premier meeting center of the Pacific. 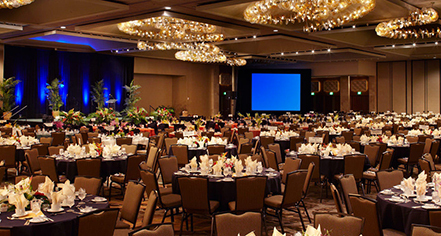 The largest convention, meeting and banquet facility in a resort setting in Hawaii. Exquisite, contemporary decor and priceless artwork have made it the leading site for many national and international meetings, as well as host to presidents, heard of state, kings, and queens. Offers the South Pacific Ballroom, adding another 5,848 sq ft and the smaller Sea Pearl Suites and the Nautilus Suites providing additional meeting and breakout rooms. Located in the largest guest tower, the Tapa Tower. Features the 16,536 sq ft Tapa Ballroom and adjacent Palace Lounge. The Honolulu Suite and 'Iolani Suite add ten breakout rooms for smaller meetings and events. Furnished with state-of-the-art sound and lighting systems and chandeliers that were specifically designed for the ballroom. Three unique chandeliers provide lighting that can bend and move various colors and allow for controlled dimming and adjusting for light levels to set the appropriate mood for any function or performance. The most exclusive meeting facility, perfect for meetings requiring intimate, personal service or greater privacy such as executive board meetings or other meetings of distinction. Offers over 4,600 sq ft of meeting space, and provides five separate meeting rooms, including the Ilima Boardroom, a sophisticated executive space that provides superior, state-of-the-art technology and features a SMART Board, interactive whiteboard that can turn computers and projectors into powerful tools for teaching, collaborating, and presenting. The Hibiscus and the Kahili meeting rooms can both be divided into two smaller rooms. The meeting rooms feature beautiful open-air lanais adding even greater ambiance and sophistication to meetings. Connects to the Mid-Pacific Conference Center for additional space. The Rainbow Suite can be divided into three separate rooms, and are ideal for smaller, elegant receptions and parties. Each room faces the serene blue Duke Kahanamoku Lagoon, and guests can enjoy spectacular views of the beach and sunset. The adjoining Rainbow Patio is the perfect setting for a pre-function cocktail party. 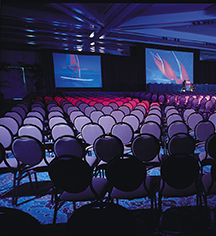 Unsurpassed group-friendly venue with unique history and natural features including Duke's Beach, Duke’s Lagoon, and Waikiki’s only private pier. Ample space and extensive experience to stage theme events. Team building beach competitions, dazzling video effects to music, classic days of Elvis and Blue Hawaii, or boat days with Duke. Customized events for attendees or spouse programs. Gross square feet is 26,435. Usable square feet is 24,500. The oceanfront Super Pool area is beautifully-landscaped with lava rocks, exotic flora and waterfalls, and can accommodate up to 600 guests. The Tapa Pool deck is surrounded by tropical gardens and can accommodate up to 350 guests. Waikiki Beach offers pristine beach settings suitable for outdoor sporting events and team building activities.